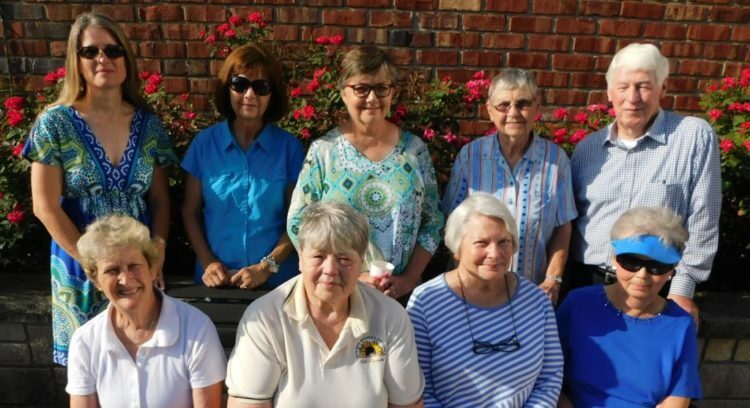 Bourbon County Garden Club, 2018. 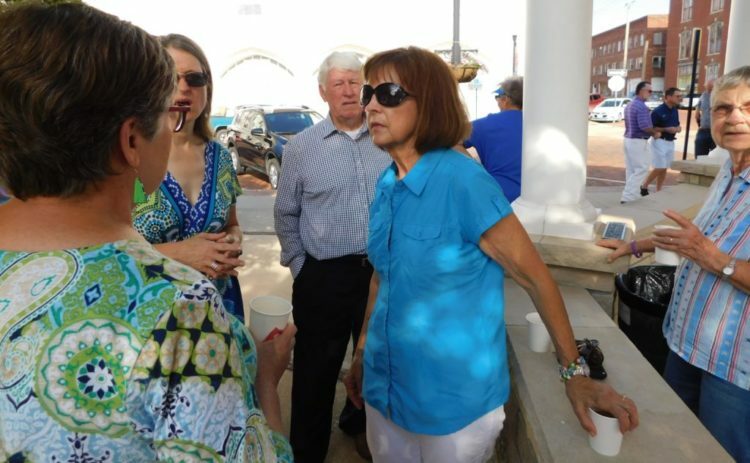 From left, front row: Barb McCord, Martha Scott, Priscilla Sellers and Karen Billiard. Back row: Rosemary Harris, Sheryl Bloomfield, Janet Irvin, Doris Ericson and Jim Logan. 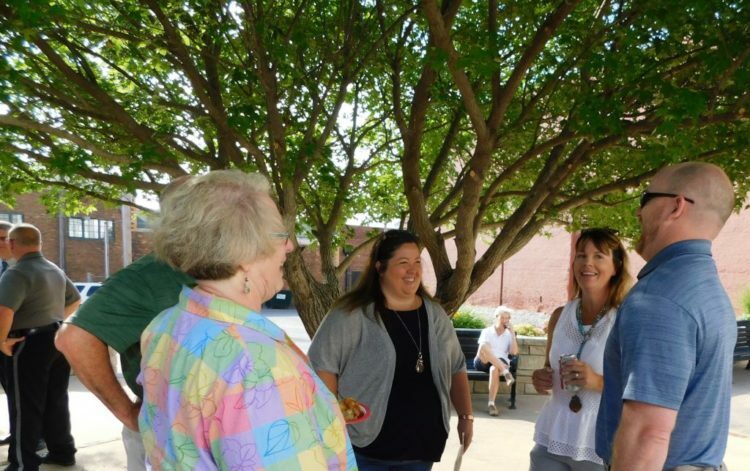 The Bourbon County Garden Club hosted the weekly Fort Scott Chamber of Commerce coffee June 28 at the Heritage Park Pavilion on Main Street. 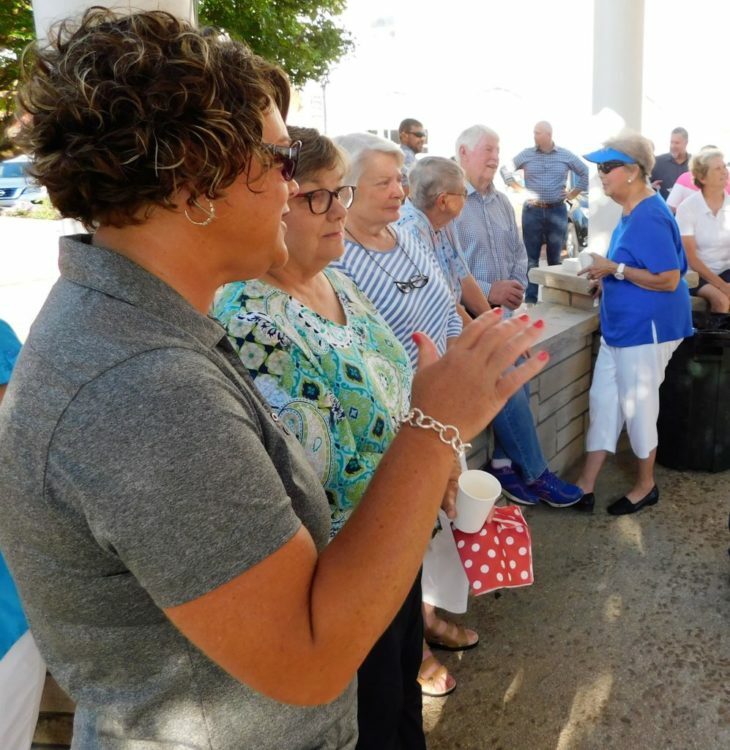 The club maintains the plants in Heritage Park, Skubitz Plaza, the hanging baskets on Main Street and the flower bed at the swimming pool, Martha Scott, a member told the attendees. They also provide a service to the community by answering gardening questions for the public. “We are happy to make Fort Scott look pretty,” Scott said. “We are looking for volunteers to help us weed,” she said. 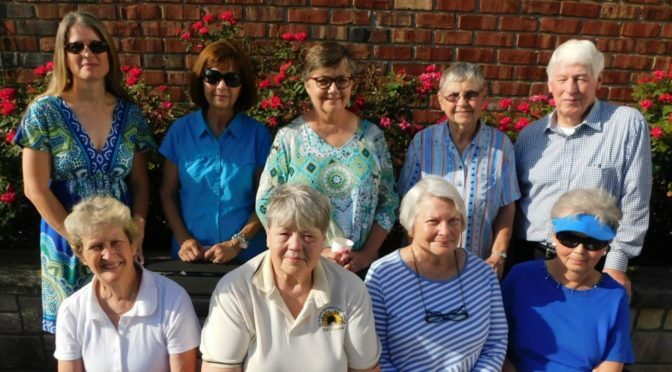 Garden club member Barb McCord told the attendees that they are looking for gardens for the annual garden tour for 2019. There will be no weekly Chamber coffee next week. Below are photos of attendees during the coffee. Kathy Crosby, wife of Ed, the (then) second baseman for the Cleveland Indians, wanted to lose weight. Her husband encouraged her and daily asking for an update. At first, she was proud of the scale’s readings and couldn’t wait to share the good news with Ed. But after a while, she realized he was “too” on board, “too” bossy about ways to expedite her weight loss. One day, when Ed was out of town on a road trip, Kathy decided to cheat. Kentucky Fried Chicken was just around the corner. Surely a piece—or three—of white meat, a scoop—or two—of mashed potatoes, and a biscuit—or two–couldn’t hurt. Plus, her husband would never know. When he would return late that night and ask, she would say she had done well. After all, “well” is relative, right? What Kathy did not know was that the local KFC had prepared a huge celebration for the one-millionth customer who crossed its threshold. You can guess who that was. As soon as Kathy placed her order, a trio of bagpipe players, the Cleveland press, dignitaries from the home office and all the KFC employees surrounded a stunned Kathy. Presenting her with a bouquet of balloons and enough chicken coupons to last a lifetime, my friend stood by, looking like she had just swallowed a barnyard of eggs. When Ed came home that night, Kathy picked him up at the airport. It took no time for him to ask how her diet was progressing. She talked about how disciplined she had been and how she had done so well. Relative, right? Ed was proud and told her so. 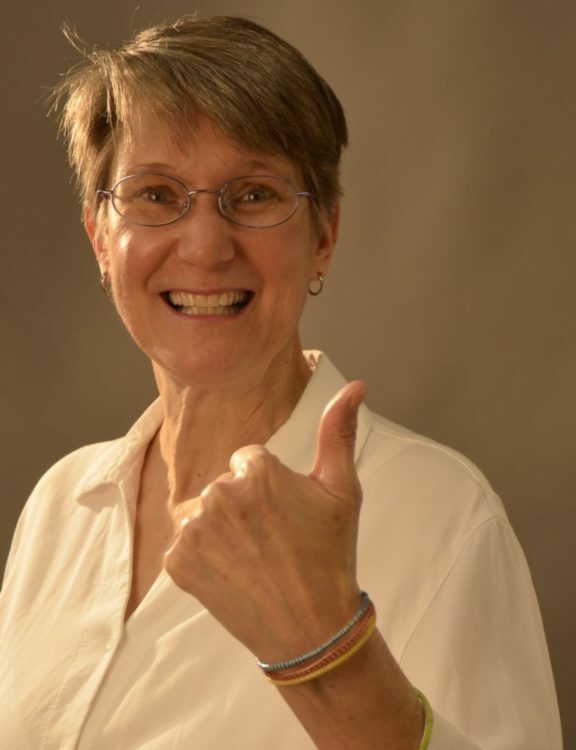 “Who has ever been serenaded with BAGPIPES?” Kathy moaned at the ballgame that evening. “We’re in Ohio, not Scotland, for goodness sakes.” My friend had been caught, greasy-handed. We wives were hysterical by the time she finished wailing. Let’s be honest. Who of us hasn’t been guilty of fudging a little to avoid disappointing or displeasing someone we care about? (Pause here. If you don’t know what I’m talking about, this article is not for you.) For the rest of us, you get it, right? Probably one of the most notorious “cover your track” guys is Israel’s King Saul when confronted by the prophet Samuel, his mentor. God had commissioned Saul to kill the evil Amalekites, men, women, children, and animals. Saul, however, spared the king of the Amalekites and the best of their animals. To him, partial obedience was good enough. Enter Samuel whom Saul greeted with these words: “Blessed are you of the Lord. I have performed the commandment of the Lord.” At this point, Saul is not doing so well. It’s confrontation time. Samuel speaks. “What then is this bleating of the sheep in my ears and the lowing of the oxen which I hear?” Busted! The title of “King” is stripped from Saul. And although Saul’s giveaway was the noise of sheep and not bagpipes, he, like Kathy, did not escape the voice of displeasure. In his case, there were two main differences: (1) The displeasure came from God and not his spouse, and (2) No one found humor in Saul’s story. In the end, neither Saul nor Kathy had “done so well”… relatively speaking, that is. There is a change to the procedure if you want to exhibit poultry at the 2018 Bourbon County Fair. This change affects both 4-H and Open Class participants. All poultry animals (excluding waterfowl and pigeons which may be potentially shown either in 4-H or open class, must be pullorum disease tested prior to the fair. Testing will take place on Friday, June 29 from 4 to 6 p.m. at the Bourbon County Fairgrounds. Only birds tested at this event will be allowed to exhibit at the Bourbon County Fair. Pullorum disease is a somewhat rare disease, caused by bacteria, but easily spread from one bird to another. The testing procedure itself is not new, but the testing date and time, (now prior to the fair) is. This change is due to the high cost and limited availability of the testing antigen. A federal veterinarian will be on hand to test birds free of charge at this event. You will receive paperwork at this testing event which must be brought back to the Bourbon County fair after 4:00 p.m. Monday, July 16, when you bring your poultry animals for exhibition. 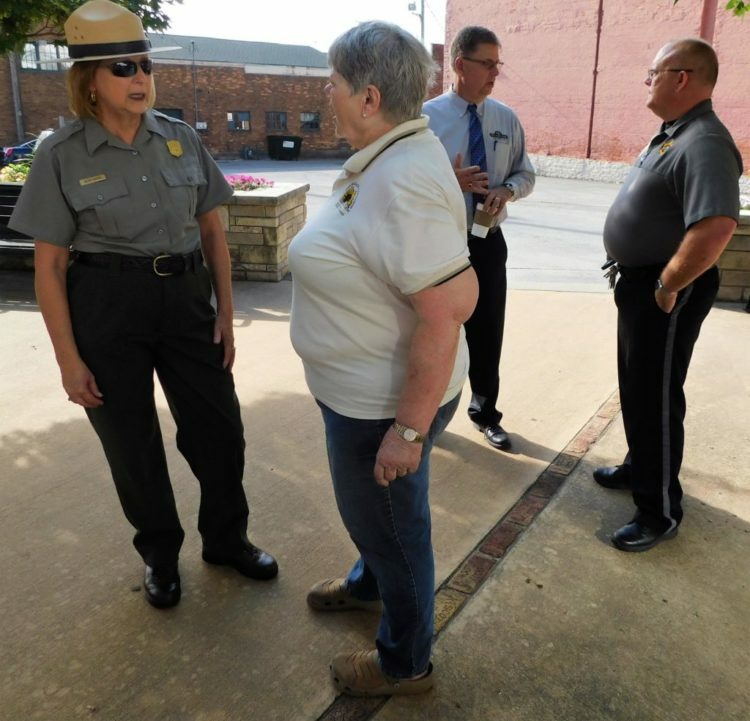 As the nation reflects on its freedom on Independence Day, Fort Scott National Historic Site honors those who have lost their lives fighting for this freedom with Symbols of Sacrifice. The Symbols of Sacrifice commemoration features thousands of American flags displayed in a Field of Honor on the historic Parade Ground. Their purpose is to commemorate the sacrifice of members of the United States Armed Forces who have died in all wars that Americans have fought in. The flags will be displayed from Friday, June 29, through Friday, July 6. 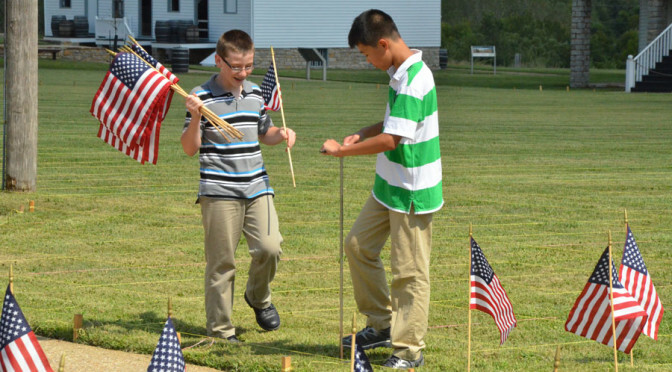 Volunteers are needed on Friday June 29, starting at 8:30 a.m. to put up the 7,000 flags for the holiday. See contacts below. The park is pleased to welcome local musicians Pat and Steve Harry, who will perform a special concert of patriotic music on Saturday, June 30 at 7:00 pm. Following the musical performance, you are invited to participate in an evening cannon firing. 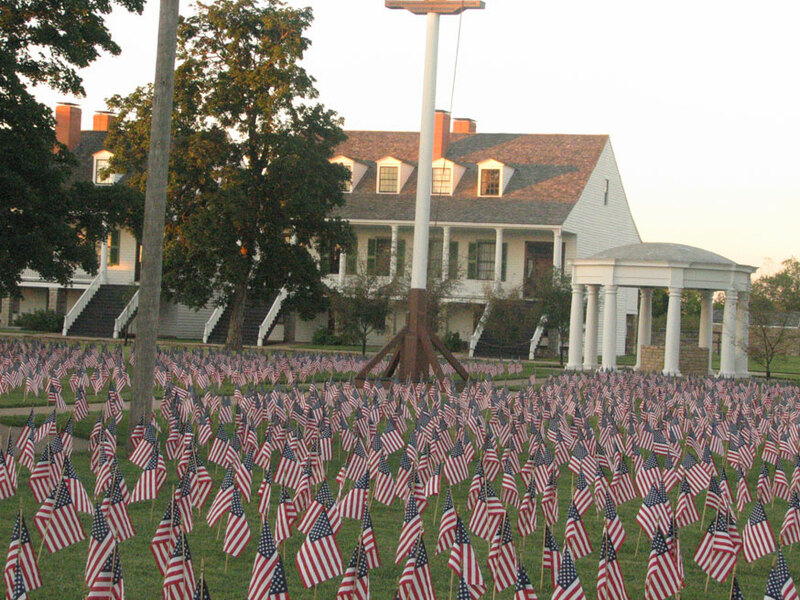 On Wednesday, July 4 at 10:00 am and at 3:00 pm, the staff at the historic site will honor the fallen through a discussion of the meaning of the Field of Honor, followed by an artillery salute. At 2:00 pm, come and witness infantry soldiers as they fire a salute to the 13 original colonies. You are welcome to fall in with the soldiers and assist in taking down the 30-star flag at 4:00 pm. Girard National Bank is pleased to announce that it will change its name and all branch location names to GNBank on July 2, 2018. Previously, branch locations operated under individual trade names. There are no ownership or bank structure changes occurring other than the change in the bank’s name. Use of a single brand will allow GNBank to serve its customers better through a common name at all of its banking facilities. The name change will simplify a customer’s ability to conduct transactions at any GNBank location, without any disruption to customers’ banking services. GNBank’s name change coincides with its celebration of 100 years of business. The family-owned and operated bank was established in 1918 in Girard, Kansas, and began expanding in 1986 with branch facilities in other communities vested in agriculture and small businesses. GNBank is a full-service community bank in 14 communities, with expertise in agricultural, commercial, small business, residential real estate and consumer services. In Kansas, offices are in Arma, Bucklin, Clay Center, Galena, Girard, Hiawatha, Holton, Horton, Offerle, Pittsburg, Wetmore and Yates Center. In Southeastern Colorado, offices are in Eads and Lamar. More information can be found at gn-bank.com. FORT SCOTT, Kan. (June 28, 2018) ­– Mercy Health Foundation Fort Scott has been awarded a $1,000 grant from the Hope 4 You Breast Cancer Foundation based in Joplin. The grant will be used to help pay for mammograms for patients who meet certain criteria. This is the seventh consecutive year Mercy has received the grant. The startling fact is that more than 40,000 women will die of breast cancer this year in the U.S. According to the Kaiser State Health Facts, the rate of annual breast cancer diagnosis among Kansas’ women is higher than the national average but Kansas women over age 50 report having fewer mammograms than the national norm. For more information about digital mammography or to schedule a mammography appointment, call Mercy’s Imagining Services at 620-223-7015. The HOPE 4 You Breast Cancer Foundation was founded in 2007 and since that time has donated over $100,000 to area hospitals and organization who provide services relating to breast cancer. HOPE is an acronym for help, outreach, prevent and educate. The purpose of the HOPE 4 You Breast Cancer Foundation is to raise awareness, provide support, offer education and instill hope for those affected by breast cancer according to an official statement provided by Kelly York, HOPE 4 You board member. 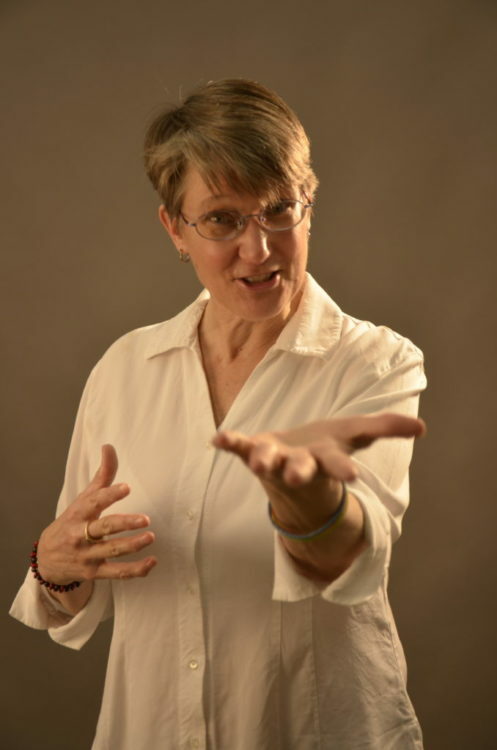 Puppeteer Priscilla Howe will return to Fort Scott for the first time in several years on July 11 for a 10 a.m. performance at the Ellis Family Fine Arts Center. 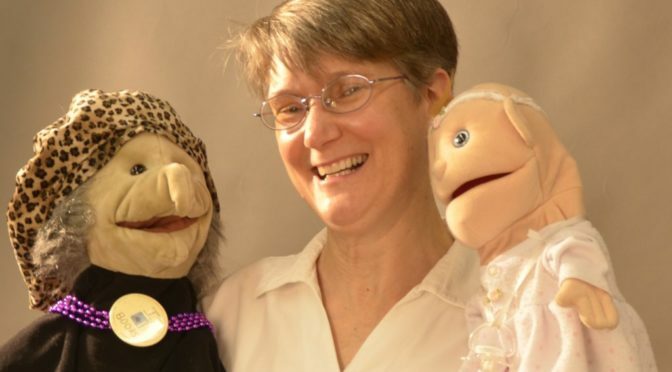 Priscilla will entertain her audience with a program based on this year’s summer reading theme, Libraries Rock!, with help from her array of puppets. The library is sponsoring Priscilla’s performance as a part of the summer reading kids’ program. Prizes for meeting reading goals and information on summer reading will be available. The performance is free and open to the public. “Priscilla travels the US and abroad (China, Argentina, Brazil, Peru, Germany, Bulgaria, Romania, Colombia, Chile, Mexico, and Belgium, to date) with a bagful of puppets and a headful of stories” according to a press release from the Fort Scott Public Library. CORRECTION: The Greenwood County Emergency Manager indicated that 100-200 volunteers are still needed but bottled water is not needed at this time. Volunteers should be able to handle the extreme heat. They also need to come equipped with gloves, eye protection, work boots and long pants. The Kansas Department of Health and Environment has employees on site working with residents to obtain critical documentation (birth and marriage certificates) and the fees are being waived. CORRECTION: The employees plan on being there through Saturday. The State Emergency Operations Center continues to coordinate recovery operations in Eureka. Door-to-door welfare checks are being conducted in the areas still without power. There will be a Town Hall meeting held Friday, June 29 at 7 p.m. at the Matt Samuels Building. The Greenwood County Emergency Manager indicated that they no longer are in need of bottled water or volunteers to help with debris clean up. If that should change, we will put out a request for those items. The Kansas Corporation Commission is reporting 1,400 customers still without power and they are actively working to restore power to all customers. Westar reports that in storms, sometimes the hardware that houses the electric meter and the wires that feed electricity into a home or business can become detached. This is the square metal box and connecting pole on the side of the house or building. If the hardware is damaged, Westar cannot reconnect the service line between the house and the power grid because it’s not safe. The homeowner is responsible for hiring an electrician to make these repairs before power can be restored to the residence. The American Red Cross shelter remains open at the Methodist Church, 521 N. Main Street, and housed seven residents overnight. The shelter is serving as a cooling station for residents and volunteers during the day. The American Red Cross is providing two mobile feeding routes along with hydration. Century Link is providing the food for feeding stations located at 100 Jefferson. The Kansas Department of Health and Environment has employees on site working with residents to obtain critical documentation (birth and marriage certificates) and the fees are being waived. The Kansas Department of Revenue put out information that residents affected by the tornado can get free replacement car titles, registration receipts, and drivers licenses if those documents were lost or damaged in the storm. Applications for replacement titles and replacement registration receipts can be made at the Greenwood County Treasurer’s office, 311 N. Main Street Suite 4, Eureka. Verizon Wireless has deployed two COLTs (Cell On Light Trucks) and operators and the COLTs will be operational sometime during the day on Thursday, June 28. Recovery operations continue in Eureka during the day and will cease from 7 p.m. until 7 a.m. to ensure the safety of those working in the area. Security will remain on-site overnight. The SEOC will scale back activation overnight to a staff duty officer and will resume full activation at 7 a.m. 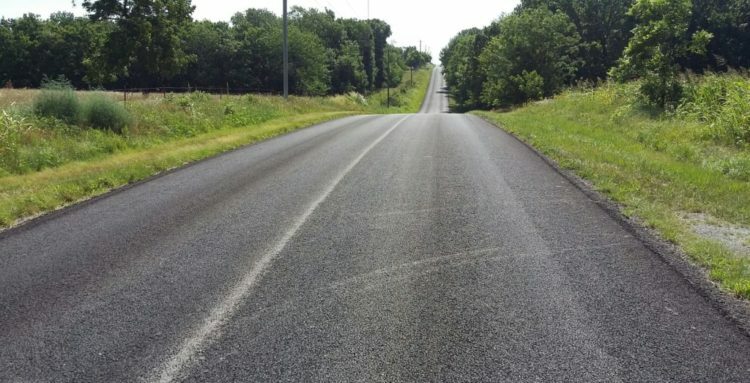 Bourbon County Road Crews completed the new asphalt on Maple Road just east of 95th Road recently. Bourbon County Road Crews have been busy this spring and summer laying asphalt on prioritized road, filling in the potholes and otherimprovements to the county’s roads. The new leveling course tactic was used three years ago in Oharah’s district, in the area just west of Uniontown on Maple Road to 85th Road. The asphalt has now been put on Maple Road all the way to Fort Scott, a road that runs parallel to U.S. Hwy. 54. Next year, if all goes according to his plan, Maple Road to 85th will be chipped and sealed, Oharah said. “If money permits, we’ll do more,” Oharah said. Other recent completed asphalt projects have been the west side of Lake Fort Scott, which was completed yesterday, he said. Then a short piece of 205th Road off of U.S. 54 Hwy. to Native Road will be completed today with asphalt overlay. One and one-fourth miles on Eagle Road completed a few weeks ago, was given a 3.5-inch overlay, he said. “Before that Native Road past the landfill a mile and a quarter, a 2-inch overlay was done on that, completed in April,” Oharah said. The next big project that Oharah hopes to accomplish is 125th Road south of Mapleton for three to six miles, he said. “Then I’ll start doing chip and seal on 125th between Hwy. 54 and Maple Road and also west of Uniontown to 85th,” Oharah said. In addition, the county road crews will start working on low water crossings that near repair. Range Road at 265th Road. “We’re going to have to replace that,” Oharah said. Northeast of 65 Hwy., on 75th. “We are going to fill in the void under the crossing with rock and concrete,” Oharah said. North of Unity Road on 95th. “We’ll repair it by pouring more concrete, boxing at the end of the culvert,” Oharah said. Another low water crossing is in need of repair on 115th Road north of Range Road, he said. Work will begin on these crossings in July, Oharah said. The commissioners will soon be moving their workspace and public meeting room in the Bourbon County Courthouse, to make it more accessible to the public. “I’m really excited about moving forward with moving everything on the second floor…to the first floor”, Oharah said. The move is a result of the new law enforcement center completion and then the sheriff’s department and jail vacating the north side of the courthouse. “We are working to have it done by the last part of September,” Oharah said. “People have trouble getting to the second floor, this will make it convenient for them,” he said. The county clerk, treasurer, and the commission room, every office on the second floor, will all be moved from the second to the first floor. He is hoping the driver’s license bureau will also be moved to the first floor, he said. The second floor will then be the county attorney’s office. “That increases the security of the second and third floors,” Oharah said. The FSPD can be reached at 620-223-1700.